Where to begin? My last blog talked about my gym failure - well, joint failure, anyway. Friday hit me just as hard. I did workout, but WOW it was sad. I had to drop my leg weights by 50% and STILL failed at 5 reps. Seriously. Sad. I felt so defeated - and decrepit. Lol. Back home, I started going through my logs, and researching, and connecting dots. As I started to form a picture, I tagged The World's Greatest Trainer (aka my bff Tabitha). I shared what was happening, how I was feeling, and what my concerns were. She asked questions... I answered. Are your calories X? Umm, yes. Are you burning X calories in the gym just in the a.m.? Not counting your evening cardio? Umm. Yeah. Are you doing this, and that? What, you have a hidden camera on me?? Yes. You do realize this is your body's way of saying F-YOU? Huh. Um. Ohhhhh! Duh! You need to reset, she said. So... 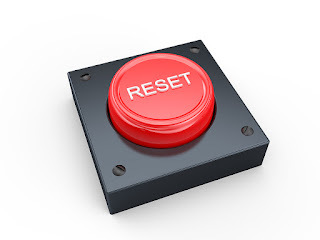 I'm hitting the reset button. After taking the weekend (the whole loooong weekend) as a total rest, and carb refuel, I am starting fresh, with a clear head. I, who don't have a single Extreme bone in my body (yes, that was a joke), went overboard - way, way overboard. I focused on one thing, to the exclusion of many others. Yes, I listened to my body, doing everything I could to avoid injury and keep pressing on, but I missed the fact that my methods and intensity were actually counter-productive. I'll skip the science lesson, and just say that I depleted my body of everything that protects my joints and muscles. My arthritis flared, my bursitis blew up, and my tendinitis said, Hey, remember me? My AC joint is on fire. My knees are shot. Go big or go home, right? This is why I need constant supervision, haha! So... I have revamped my food, my lifting, and my cardio. I am focused on replenishing my body's natural resources and reducing inflammation. I no longer care if I can see my abs for the Arnold - as Tabitha put it, it's more important to be able to walk. Lol. This morning I felt better - hit the gym for leg day. Didn't see big improvement from my last debacle, lol, but my joints are pretty bad and our weather took a dive - rain and cold (never good for arthritis). I did a moderate cardio session, headed home and ate, and will do another moderate cardio session later, depending on how my knees feel when the time comes. Today is a full day for me, lots of work (work and more work! ), plus errands, and Shiloh comes home this afternoon (yay!). My mind is calm, and I'm ready for what comes next. :-) Thank goodness for the reset button! I'm glad you were able to figure out what was going n and taking the time to listen to your body. It's so easy to forget something that is such common sense because our mind wants to ignor the body and keep pushing.